Mega Sale! 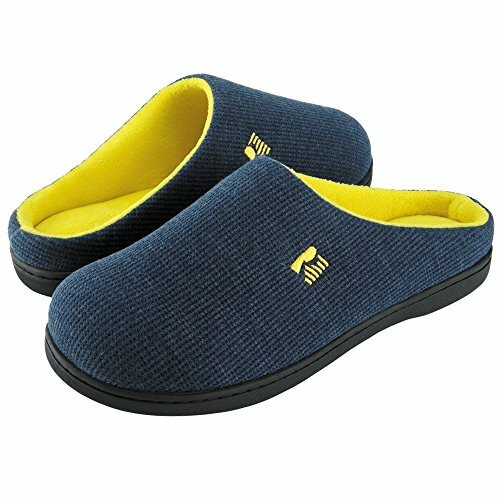 Save 29% on the RockDove Men's Two-Tone Memory Foam Slipper(11-12 D(M) US, Blue/Maize) by RockDove at Stuart Pynoo. MPN: SL-M2C-NB-L. Hurry! Limited time offer. Offer valid only while supplies last. Based in Los Angeles, RockDove traces its roots in fashion apparel, with the goal of creating footwear that not only feel good, but also look great. Based in Los Angeles, RockDove traces its roots in fashion apparel, with the goal of creating footwear that not only feel good, but also look great. Because the same high standards for outdoor shoes don't exist for what we wear at home, far too many of us have suffered through flimsily made and overpriced (not to mention, boring looking) slippers our entire lives. RockDove was created to change that. From high density memory foam comfort, orthotic support, hand-sewn seams, to killer looks, nothing is ever too extravagant for "just a pair of slippers" according to our philosophy. Our aim is to wow you the moment you set foot in a pair of RockDove's, and be the only brand of slippers you'll ever want to wear. ✔ Trendy two-tone style features beautifully contrasting colors that don't fade over time. ✔ Soft cotton knit material with waffle texture makes your footwear more breathable and odorless. ✔ Versatile TPR outsole containing shock-absorbing EVA allows you to occasionally wear these slippers outside the house like regular shoes. ✔ Epitome of comfort that will keep your feet warm, cozy, and relaxed from the minute you slide into them in the morning, to the last second you take them off before bed. ✔ Interwoven side seams form a nearly inseparable edge between the upper and sole, making these slippers withstand wear and tear for years. - Machine wash on cold settings. Air or line dry preferred. Do not bleach. - Get matching slippers in ladies' two-tone colors by searching for "RockDove". - If you're between sizes (e.g. men's 8.5, 10.5 or 12.5), please get the next size up. - Convertible to big kid sizes by subtracting 0.5 from the men's size. If you have any questions about this product by RockDove, contact us by completing and submitting the form below. If you are looking for a specif part number, please include it with your message.